In addition 1,842 VIP came to pay tribute and 29 Blessed Companies (?) came, thousands of reports were made in the news around the world. July 2010 Completed Restoration through The Proclamation of True Parents of Heaven, earth and humankind. True Father completed all responsibility and mission on earth. First Day of Cheon Il Guk was proclaimed. You sent upon the earth, The True Parents, Sun Myung Moon and Hak Ja Han and They have proclaimed the Kingdom of Heaven on earth... We thank you for this Providential moment in human history. We feel the shock and the pangs of no longer being able to see Him Face to face... our faith reassures us that even though His Body returned to earth His Heart returns to You who gave it.. and You are now One... What more could we ask of eternal life? True Father proclaimed Your will to conclusion and we are called after His sincerest devotion. True Mother will lead us to fully realize Cheon Il Guk. That time has come. May God Bless this Glorious Moment. Rev. and Mrs. Moon have 13 Children and 70 grandchildren. These are the Peace Ambassadors who helped True Father when He was alive in His Peace Activities. Everybody who is here today, I know you also want to offer your floral tribute. After the main event, we will keep this for Father and outside by the fountain please use that place prepared. You gave us everything You had. True Father was the Manifestation of The Word and Loved The Word more than anyone else. As He spoke, drops of sweat fell to liberate every person. The Teachings you gave after staying up all night have now become the standard of our lives and The Scripture of humanity. The WFWPU NGO's gained status with UN and are suggesting new world alternatives. Father, You proclaimed that You had accomplished everything, leaving this final prayer behind. Beloved Father, on this 1st Anniv of Your Ascension, please open the Gates of Heaven and help us realize Cheon Il Guk as we attend Mother on earth. Now we will welcome our guests to the stage to offer Father remarks of commemoration. 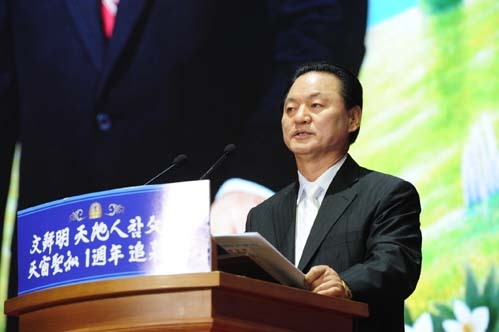 Chairman Lee Sung Ge?, an elder Senator of Korea, Independent activist, one of the first people to lead democratization and industrialization of Korea... He and True Father had a deep connection and they were sworn brothers. One of the first ones who came to the Cheong Seong after hearing the news of Father..
Today is the First Anniversary of Rev. Sun Myung Moon's passing to the spirit world, a rite called Seonghwa. I consider it a great privilege to speak in honor of His Memory before all of you from around the world who have come to pay respects to our Beloved Sun Myung Moon. 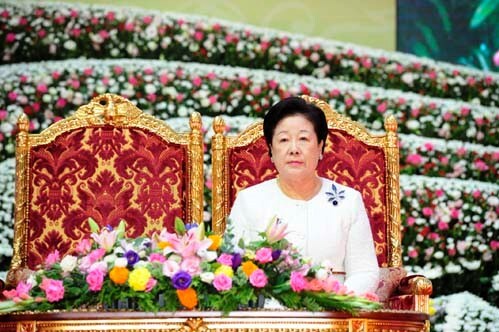 First of all, I like to offer my deepest condolences to Mrs. Hak Ja Han Moon and the bereaved Family. Standing on this stage brings me back memories of last year when I came hurriedly to Cheon Sung Gun where Rev. 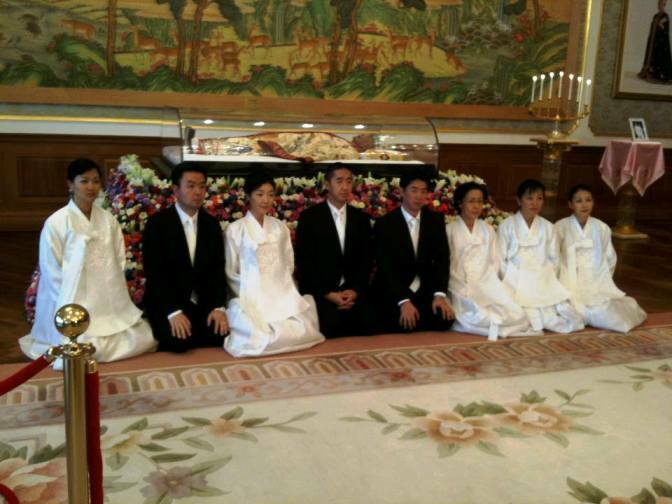 Sun Myung Moon's Body was resting. Ladies and Gentlemen, Who was Rev. Sun Myung Moon Who we have come here to remember? Even in greatest conflict, He overcame. He is a great leader who has strived for peace and is the eternal symbol of peace. He is a great man Who has lived his Life practicing the ideal of King, Teacher and Father; an ideal cherished by our people for a very long time. This great Man did not just come and go. We have not a shred of doubt that He is still here with us in our hearts. You who have gathered here today from all around the world are the very evidence of this. Ladies and gentlemen, 10 years ago on July 17, 2003, when the first Peace Cup tournament was held in Korea I made a promise with Sun Myung Moon to form a time of sworn brothers. Here I also promised that even though we are old men, we will liberate our brothers in the North and see the unification with the North. When I stood at the forefront to demonstrate the Korean people's gratitude, I did so as a promise to fulfill that promise of unification. This project was the first of its kind. Even the S. Korean government did not consider doing it for the past (long) years... for unification of N and S Korea. Ladies and gentlemen, there was no such person in the history of this nation putting His Life on the line to go meet Kim Il Sung to discuss unification. He urged him, holding his hands to accept Unification Thought as the only way. His unwavering Spirit of Love serves as a great model and infuses us with great courage. Now, the promise I made with Rev. Sun Myung Moon will soon be realized by the efforts of our descendants. When we look at what is happening, it is only a matter of time before N Korea gains freedom. Rev. Moon, please be assured of this. Ladies and gentlemen, why have we come here today? Needless to say, we have come to protect the great Teaching of Rev. Moon Who walked the course of True Parent, Teacher and Leader of Peace. We have come to inherit those Teachings and make them blossom so that His Teachings are realized. In Korea there is a saying: 'Only when the servants work properly, the Master can be a True Master' There is another saying: 'The student makes to Teacher shine'. and ' It is more difficult to maintain than to create'. When students act properly the leader will be respected as well. Please uphold Rev. Moon as The True Parent, Teacher and Leader. Are you not Their servant, their children. You are the ones that are chosen from 7 billion people of the earth and saw Him when He was still alive. You received His Love like no other. I like to ask you to give your devotion so that countless fruits can be made from His devotion. 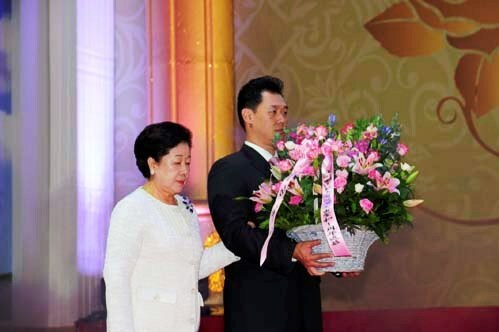 We must not forget for one moment about the sincere efforts of Mrs. Hak Ja Han Moon. We should always be grateful to Her. Ladies and gentlemen, I urge you to become the lantern of hope and the subject of people's praise, with all my heart. I hereby conclude my speech. Thank you Mr. Lee Sung Ge? 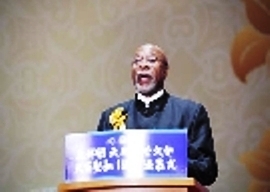 Rev Moon is generally known to the people of the world as a religious leader and founder of a religion. 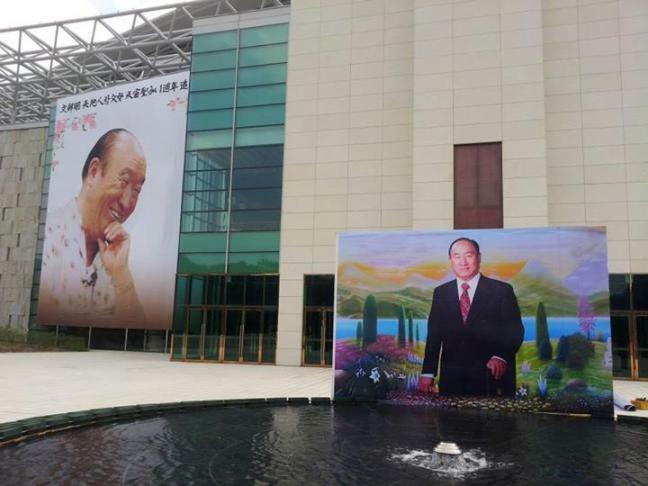 Some people see Him as a Peace Activist some as The Messiah Who gave His Life in order to realize peace; but, these are not enough to define the greatness that defines the Man, Rev Sun Myung Moon. He stated that when someone begins to have sensitivity to the truth of His Life, tears fall like a waterfall from His Eyes... Like no other, He experienced such persecution and great sorrow. We are here, not merely because He rose like a phoenix from such sufferings, emerging and continuing to give His all, not remembering back what He gave... even through such sufferings... That was His philosophy, to live for the sake of others. Rev Moon showed us through His Life that there is always hope just like when the sun is there with only seeing black clouds of rain. Distinguished guests who love peace I want to extend my sincere heart of gratitude to those who prepared this event of commemoration and made it possible now.. The song of love that remembers Your Voice embraces Your silence. It was truly a beautiful poem and remark. Elected 5 times as... and Presidential Candidate... Jose de Venecia Jr. Our Peace Ambassador who has always respected Rev. Sun Myung Moon from deepest of his heart. It is my great honor and privilege to have the opportunity to share with you a few words this morning to honor the Life, Teachings and Legacy of our Father Moon. Dr. Sun Myung Moon has passed away to the spiritual world one year ago today. I am always moved and uplifted when I come to Chung Pyung. My wife...Geneya? and I have had the very good fortune to visit Father and Mother Moon many times in this holy place in this holy land. In particular, my wife Geneya? and I will never forget the kindness and compassion shown to us from Father and Mother Moon after the passing of our beloved daughter when our house burned down. Both of us were deeply moved by the love and care which both Father and Mother Moon provided at one of the most difficult times of our life and we will never forget their generosity and loving kindness. When I learned of Father Moon's passing 1 year ago, I was dumfounded and I immediately came to Korea. I have seen him on so many occasions standing at great events and speaking with such dynamics and energy for long periods, and I could never imagine Him dying and passing away. Of course, each of us resides on this planet earth on borrowed time and is destined for a higher place we go in the spirit world. I know that Father Moon is alive and well in the spirit world and wherever He is in that eternal world, Father continues to speak and give the dynamism that we experienced from Him in this earthly plain. Excellences, people of prayer, can you imagine what I am saying is true. Is Father Moon not here today in our midst? Yes, I can see and hear that you totally agree. In fact, I feel His Presence in the mountains right here in our midst as strong as ever as when He walked this earth. Can't you feel His Presence right here in this coliseum? I never met Father Moon when Mother Moon was not by His Side. They were inseparable.. In fact, I think They are still inseparable. Yes, I believe Father Moon is here right in our very midst. They say 'Behind every great Man, great Leader, stands a great woman; and, I know it is also true of Father Moon and Mother Moon. We are Blessed that Mother Moon Who knows Father Moon better than anyone is Herself standing strong to carry on the great legacy that Father began. Let us now give our full support to Mother Moon. For what is this world? Father Moon was the Leading Force in global faith, dialogue between religions, cultures, civilizations... He knew we could never have peace without unity of the different religions and that is why Rev. 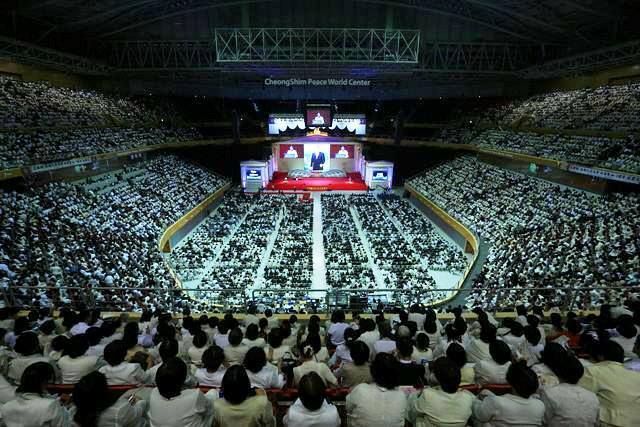 Moon is honored by Christians, Buddhists, Muslims and all the religions of the world. He is loved even by the people of North Korea. Helping, marriages and families. He knew that the family was the school of love, ethics and character. My wife participated in Father and Mother Moon's Blessing Ceremony to strengthen marriage and family. In the International Leadership Conference, we have been studying and have a greater appreciation for this Man of God Who with single-minded devotion, not only proclaimed but also practiced His Mission for living for the sake of others. 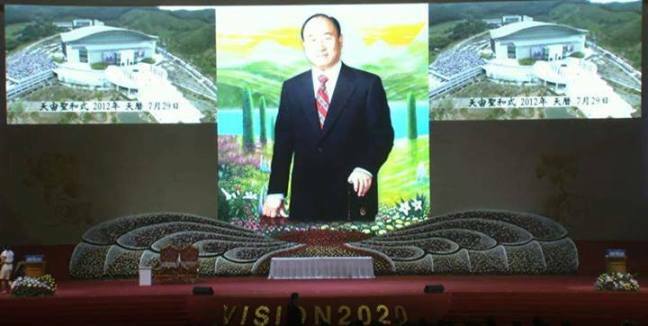 Delegates from around the world, our beloved people of Korea, as we go forward from this day, let us keep the vision, the memory and the works of Rev. Father Moon close to our own hearts. 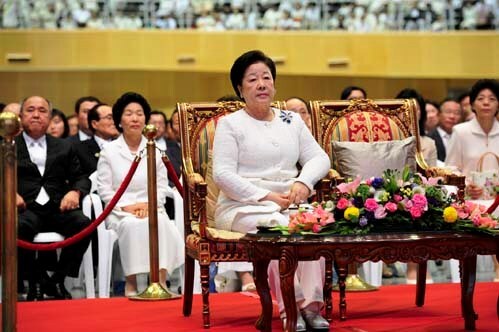 Our greatest living testimony of our appreciation to Father Moon will be that we carry on with the work He gave us to do, with Mother Moon, the work for peace, international development and cooperation, the work for true families. Excellences, friends, ladies and gentlemen, let us never alter in our resolve. We are here not only to mourn but to carry on with Mother Moon, strive until the good fight is won. Yes, peace is achievable, peace among nations, peace in the hearts of men. Finally, we say, Father Moon, Mother Moon, we honor You and love you thank you very much. Please give another big applause for this address. Precious, significant, remarks by the leaders were really moving. Then all Blessing Families will have a poem entitled 'A Letter to Father' and so, a very famous actress in Korea... a Peace Ambassador will come forward and recite this poem. Guided you on that path are blinded by the tears from our heart. On this lonely path, You followed the Will of God's Providence, You went the path of Golgotha. You pushed back Your Tears. Your determined role toward million was strong and silently You wept after readings letters from members who were prisoners in Communist prisons. Father, we will see You again in the next world. America must awake, so You cried in the land of freedom... Even while embracing Kim Il Sung, You wielded an iron road toward the nations, yet to us, You were always a passionate and affectionate Father. Last year, as autumn was falling, the sad news that You had ascended left all of us dumfounded. Before ascending to the Heavenly Nation, You gazed into True Mother's Heart and You sat before True Mother at a table for two. You went to Your Hometown... You were attached to an oxygen tank saying your last farewell. When You prayed it is all accomplished, tears welled up in my eyes and my heart aches thinking about it. Father, no matter how many times I call you, I call you again. Father, I miss you dearly. You are the Light of my life. You are an ever expanding ocean to me. Father, when you suddenly ascended to the Heavenly Nation, we assumed that True Mother would be the most crippled by grieve; yet, She raised the torch saying that there is no stopping. You must give all your resolution with all your heart. She raised high the torch of Love. Father, You spend each day like a thousand years, as You went forward to open the Kingdom of Heaven. 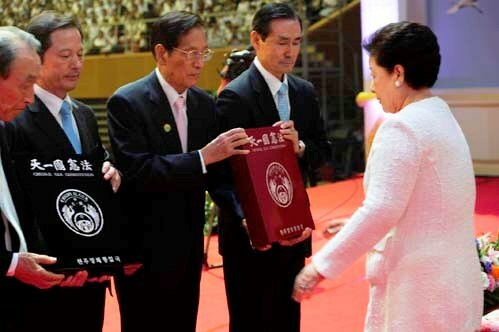 The Cheon Il Guk Constitution and White Book will be dedicated to The True Parents. True Father already talked about The Constitution and we are creating the environment and 16 scholars made deep research in 16 months and 8 public meetings from 22 countries.. In the future subordinate laws for life shall be under this Constitution and now representing Kim Hung Lee, Rev. (4 former national leaders of Korea) now coming onstage. This was Father's long hope. Heavenly Parent, lonely 6,000 years... only after that did God's 6,000 years resentment resolve.. waiting with a concerned heart that maybe the central figures would give up in the middle, what He went through in pain.. while as B families with the love from God and True Parents, we were actually very small and inadequate, but enable our dreams to become the dream of Heavenly Parent and True Parents and may we achieve with God achieve that One Family Under God centered on True Love. Enable us to realize that country, to really stand on Your Homeland and become people who do everything we do for that. I'd like to convey my gratitude and all Blessed Families and members around the world. Today, we have become one. Even now, Father is looking at us with a big, beautiful smile and I feel Father doing this right now. And so from now on, from August 3, 2013, there was a peace march that started in Japan and they would march all the way to Incheon dong. They had a bicycle march for peace with the hope to realize unification of North and South Korea. Our conditions and dedication should not end at Incheon dong. It should move on to the whole world and in realizing the free and peaceful world The Kingdom of Heaven on earth let us advance until we achieve it. On this very good day, with all the distinguished guest, beloved members and Blessed families, True Father is living in our hearts. Let us all become one with Him and realize Heavenly Parents and True Parents Will on earth while we are still alive. We will become true children and loyal to do so. It is my hope that you make this determination to do so. This concludes the first part of this event. 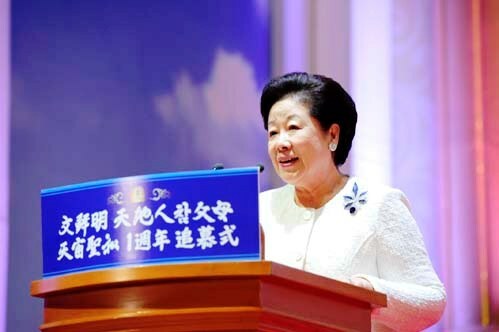 First part, we have listened to Mother's Speech at the conclusion and toward the 2020 we will shout out and soon we will begin the second part of this event. Today this beautiful screen that you are watching at this moment is 24 meter in width and 9 in height put together, 3x brighter pixel 3 millimeter (smaller than existing 9 millimeter) Please thank all the staff that prepared this beautiful stage. Now our performance, First the Grandchildren will sing songs that True Father liked. 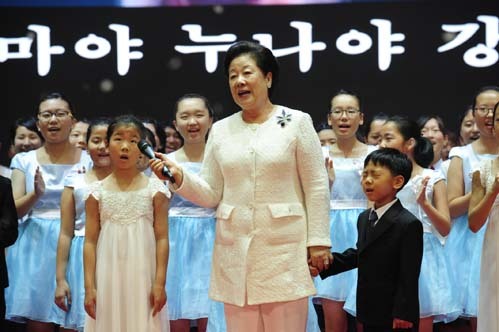 The future leaders' children will sing three songs; and, as they show us the performance, please welcome them with a round of warm applause. Now from South American a world-level singer, Gloria, comes to pay respect to Father. She has sung in many different places and participated in so many of our events. Thank you. That was indeed a heart moving song. Next chorus 93 students from Japan won a prize at a chorus contest. Father, let us escape from this sadness and I will raise His Voice and His Word and bestow The m upon this humanity that they may know. Father, please no longer be sad. Stop crying. I will fulfill Your Wishes. Mother, Mother, Father is imprisoned at Danbury... It has been only half a year after the passing of Heung Jin Nim. How can Father be imprisoned like this. Our hearts are ripping apart. Father has been persecuted His entire Life, always trying to extend the Words of God. How could He be treated like this. Please all this is part of what we have to pay indemnity for. We need to help Father so that He can fulfill His restoration Providence. Oh God, You have made me stand alone. I am a Wife of a Man and the Mother of 14 Children. How could I not feel pain and suffering. In front of this Course, I have sent many of my Children ahead of me. I am only a weak woman. Please allow Your Courage to dwell in me. God, I will fulfill the promise I have made unto You and I will endure everything with solemn heart. I am prepared to endure any suffering course. Please guide me so that I can fulfill this mission that You have given me. Many things happened afterward. Endless sacrifice and sufferings that seemed never to end, persecution. This persecution is the last attack of Satan. I am not afraid. I have endured many persecutions. This is part of the course of Father. I will overcome it. Mother: This mind and this body belongs to You. We are no longer orphans. Though I am still young and lacking, I will serve my Lord with all of my heart. Others of enemy: Stop them at all cost. They threaten our power and position. Let them taste the flame of hell so that they will never question our authority. Cut them down leaving nothing behind but unfathomable darkness. I am torn apart but I have to fulfill the wishes of God. Children: Yes, even though there was such sufferings, True Parents have put Their all for humanity and achieved things that were only in dreams. Look, True Parents are smiling like this. Many people have received the salvation and eternal life. Oh Heaven Parents that have sent us the True Parents of Heaven, earth and humankind, thank you very much. They have taught us the true meaning of True Love. We love Them truly. Father: My beloved children and family members... We finally welcome this age of Cheon Il Guk... Without your efforts and pain, we would not have been able... We have cried and laughed together for the past 60 years... The times are engraved in each of my bones. Because I was with you, I was so happy. Though my body is in Cheon Sung Gun, my spirit is with you and I will always bleed with you... True Mother will lead you with Her warm Hands. and in the spirit world I will protect you and I will shed light on the path that you lead; and, let us believe and perfect the ideal of Creation. My burning Heart will always flow, so please use my Love as the Power that drives you.. I love you. I love you. I love you. My Wife, My True Mother, Who has been with me for more than 50 years, how do I thank you enough. Mother: My Husband, My True Father, I Love You so much. You have accomplished so much that cannot be accomplished by words that can only be done by True Parents. Now people are marching forward to Vision 2020... All members who are here today, please help us from the spirit world. Father: I already know Your wish and hope and from the spirit world I will use all my heart and emotions to serve and protect You. I Love You My Wife Who have always stood beside Me. You are the One that I cannot do without. You are My True Partner Who God Gave Me. Mother I already know everything You do not need to speak a Word. You are The Partner that I received from God. This path of True Love that god allowed us to walk. No persecution or hardship will stop us. Mother: I have received as a Blessing from God all of what I have received from You with You. God: I am truly grateful for all the works that You have done; but, there are still the people who wait for true Love. Father: I will always be with You. We will not stop. We will march forward without stopping.. Mother: Omaya nu naya... this is a son that Father Loved.